Take the guesswork out of gift giving. A Papa John’s eGift Card can be given to anyone who loves great tasting pizza! It is the perfect gift for those “hard to buy for” people on your shopping list. 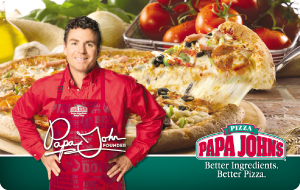 Papa John's eGift Cards can be redeemed at more than 3,400 participating restaurants in the U.S. Papa John's eGift Cards do not expire or have service fees. The amount contained on this card may be applied toward the purchase of food, beverage or a gratuity from any participating Papa John's restaurant in the U.S. Card does not expire and no fees will be charged. Each time the card is used, the purchase amount will be deducted from the card’s stored value. Verification may be required if the card is used other than by physical presentation (such as telephone or online ordering). If the card is lost, stolen, damaged, destroyed or used without your permission, it will not be replaced or replenished and you will lose any remaining value on the card. This card is not redeemable for cash, unless required by law.